For Asheville weddings that combine both sophistication and charm within a rustic setting, host your special day at The Horse Shoe Farm. Not many outdoor Asheville weddings can rival the spectacular views of The Horse Shoe Farm. 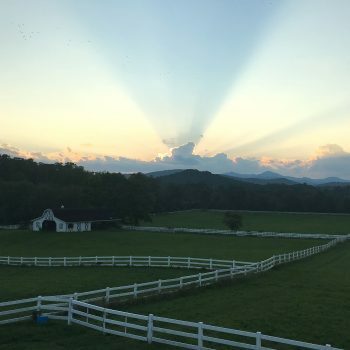 The majestic Blue Ridge Mountains provide a breathtaking backdrop to the farm’s 85 acres of pristine pastureland. And crisp, white fencing also cuts through the lush green pastures, providing the perfect setting for a romantic outdoor ceremony. Our expansive acreage can easily accommodate large tents, tables, decorations and seating for up to 500 guests. The immaculate estate perfectly meshes modern, luxury amenities with the natural beauty of untouched farmland. However, The Horse Shoe Farm also offers a variety of climate-controlled event venues for indoor Asheville weddings. The Sunset Barn is a popular venue that boasts 6,500 square feet of heated/air-conditioned space. Lift the four large retractable doors to bring in lots of natural light and expansive views of the farm. Allow your party to spill out onto the concrete patio and soak in the sights from one of the highest points on our property. The Sunset Barn also features a partition, which allows you to split the room in two. Transition seamlessly from ceremony to reception or cocktails to dinner without ever leaving the space. The Big Sky Barn is another available climate-controlled event venue at The Horse Shoe Farm. 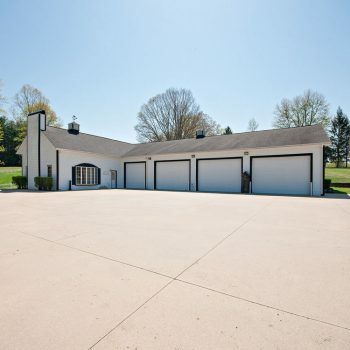 The 6,000 square-foot barn is centrally located on the property, and can easily be used in conjunction with other facilities. The Silo Cookhouse is the farm’s residential restaurant and boasts indoor and outdoor dining areas, and impressive menu and a commercial kitchen. Allow us to handle on-site catering for your event so you can relax and enjoy the day. The Horse Shoe Farm also features a number of guest homes that are available to rent during your event. How many other Asheville weddings features luxury accommodations within walking distance of the main event? From spacious manors to cozy cabins, we have the rentals to suite your needs. Browse our online wedding brochure to view our available packages. Asheville weddings hosted at The Horse Shoe Farm are ones to remember!